The ultimate funny Mother's Day gift. 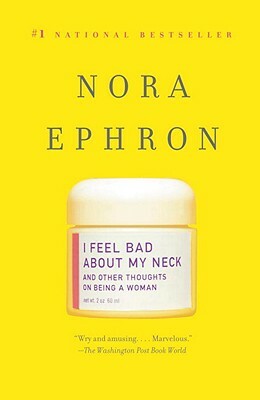 With her disarming, intimate, completely accessible voice, and dry sense of humor, Nora Ephron shares with us her ups and downs in I Feel Bad About My Neck, a candid, hilarious look at women who are getting older and dealing with the tribulations of maintenance, menopause, empty nests, and life itself. Ephron chronicles her life as an obsessed cook, passionate city dweller, and hapless parent. But mostly she speaks frankly and uproariously about life as a woman of a certain age. Utterly courageous, uproariously funny, and unexpectedly moving in its truth telling, I Feel Bad About My Neck is a scrumptious, irresistible treat of a book, full of truths, laugh out loud moments that will appeal to readers of all ages.